Shopping made easy with the Shopper’s Stop mobile app! Now shoplatest offers in fashion and enjoy an unparalleled assortment ofapparel and accessories from leading fashion brands through ourmobile app. Shop from a wide range of options in men’s, women’s andkids’ apparel, fashion accessories, luxurious watches, cosmetics,stylish footwear, furnishing, home décor and more. And get themdelivered to your doorstep. All this and much more is possiblebecause Shopper’s Stop, India’s leading store is now in yourpocket. It’s also an awesome opportunity to become the FirstCitizen member of Shoppers Stop. Take membership directly via theapp or link your First Citizen membership card and earn pointsevery time you shop and redeem them on your next purchase. Nowavail opportunity to shop anywhere & anytime with the Shopper’sStop mobile app and get a seamless shopping experience. We providethe “BEST” value in terms of products and services matching globalstandards of performance. BENEFITS OF SHOPPING FROM THE SHOPPER’SSTOP APP: USER-FRIENDLY: Enjoy highly intuitive, interactive and aninnovative app. Let’s you enjoy shopping to the fullest with auser-friendly design. FIND PRODUCTS YOU LOVE: Shop shirts, pants,kurta, etc. for men, women, kids as well as accessories includingwatches, perfumes, handbags, and many more along with home décorand essentials for your home from our vast array of top fashion,beauty and lifestyle brands including Tommy Hilfiger, LouisePhilippe, Lee Cooper, The Vanca, Imara, Biba, Mother care, Lakme,Fossil, RayBan, Casio, Titan and many more. BRANDS OF SHOPPER’SSTOP: Shop latest trends in all kinds of apparel for all age groupsfrom brands of Shopper’s Stop including Stop, Life, VettorioFratini, Elliza Donatein, Kashish and Haute Curry. EXTENSIVEPRODUCT CHOICE: Get exclusively selected merchandise,categories, colors, fabrics at truly competitive prices. 24x7 ATYOUR CONVENIENCE: Enjoy FREE delivery across India with cashon delivery option. Try & Buy with Hassle-free Returns.FIRST CITIZEN: Extra benefits and privileges along withrewards for our loyal First Citizen customers. Also exclusiveoffers for First Citizen customers only. STYLE HUB: Trends,Styles, Look-Books, Guide-Books we’ve got it all covered foryou. Keep up with the latest fashion and get tips from expertsthrough our style blog and style hub. SOME MORE EXCITING APPFEATURES: - Refine your search based on popularity, discount,prices, colors, sizes and more using sort and filter features. -Get notifications on best deals and offers. - Fast and SecureCheckout: Pay by cash-on-delivery, net-banking, or credit and debitcards options. - View detailed product information with rich imagesand style notes from our fashion editors. - Log in seamlessly usingFacebook and Google. - Wish list & Collections: Save stuff forlater by adding to your wish list straight from the app. - Sharingmade easy: Get style suggestions from your friends by sharing onWhatsApp, Facebook, Twitter, and email. - Post shots of how coolyou look, and get the community to express their likes. PRODUCTDESCRIPTION: Get the best online shopping experience withShopper’s Stop app that offers you FREE Shipping, hassle-freereturns guarantee, and a convenient cash-on-delivery option. 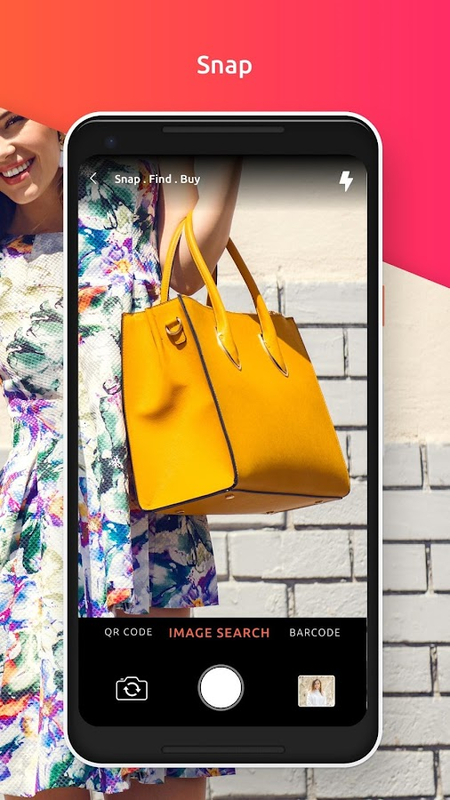 Browse through countless product styles from hundreds of brandsinstantly on the Shopper’s Stop shopping app. Discover the latesttrends in lifestyle and shop for clothes, kurtis, sarees, shoes,t-shirts, jackets, jeans, bags, skirts, dresses, jewellery,watches, wallets, footwear and much more. With the app, you haveaccess to free styling tips from our fashion experts, and hotoffers and deals on all your favorite products. We would love tohear from you. Drop us a line at [email protected] something new! Craftsvilla Online Shopping App India’s Best Online Shopping MobileApp for Ethnic Fashion Online shopping just got a whole lot betterwith the all-new Craftsvilla app designed for Android phones. Thenew and improved version of the Craftsvilla mobile app makes sureyou that you don’t miss out on the latest trends in ethnic fashioneven when you’re on the move. Download the app to stay updated onour best deals, offers and mind-blowing discounts. The newCraftsvilla app is user-friendly and offers you Premium QualityProducts, Free Shipping, Hassle-free Returns, Easy Order Tracking,100% Buyer Protection Guarantee and a Convenient Cash-on-Deliveryoption. The super-easy interface helps you browse through over 4million product styles by 24,000 vendors even while you are on thego. So, download the app now to discover the latest trends inethnic fashion and shop from the largest collection of kurtis,palazzos, skirts, sarees, salwar suits, lehengas, jewellery, homedecor and more! Here’s what the Craftsvilla mobile app has tooffer: APP FEATURES • Smooth log in: Quick and easy log in withFacebook and Google. • One touch wishlist and add to cart: Saveyour favourite products for later by adding them to your wishlistor cart straight from the app. • Simple search: Improved filtersand sorting options to let you choose your favourite products bypopularity, discount, price, colour and more. • Hot deals andoffers: Be the first to know about everyday deals, festivediscounts and exclusive app-only deals. • Fast and Secure Checkout:Multiple payment options - Cash On Delivery, Credit/Debit Card, NetBanking - available. So, get ready to tap into the world of ethnicfashion and spoil yourself with the largest collection in ethnicfashion across the following categories: * Women's Ethnic Fashionand Wear: Designer Sarees, Suits, Salwar Kameez, Anarkali Suits,Bridal Lehengas, Jewellery, Traditional Dresses, Kurtas and Kurtis,Leggings, Bollywood Sarees, Men’s and Women’s Accessories, andBags. * Sarees: Lehenga Sarees, Cotton Sarees, Designer Sarees,Banarasi Sarees, Bandhani Sarees, Bollywood Sarees, Silk Sarees,Kanjivaram Sarees, Chiffon Sarees, Net Sarees, Half Sarees,Paithani Sarees, Uppada Sarees, Heavy Work Sarees, GeorgetteSarees. * Designer Wedding Collection: Wedding Sarees, LehengaSarees, Wedding Lehengas, Wedding Wear, Wedding Suits, LehengaCholis, Designer Cholis. * Jewellery: Bridal Jewellery, Necklaces,Earrings, Jhumkas, Anklets, Bangles, Engagement Rings, TerracottaJewellery, Pendant Sets, Maang Tikkas, Mangalsutras, Nose Rings,Bracelets. * Mehendi Designs and Rangoli Designs: Bridal Mehndi,Wedding Mehndi, Pakistani Mehndi Designs, Arabic Mehndi Designs,Eid Mehndi, Diwali Mehndi Designs, Rajasthani Mehndi Designs. *Home Decor: Bedsheets, Quilts, Curtains, Carpets and Rugs,Tableware, Lamps and Lanterns, Photo Frames, Paintings, WallClocks, Mirrors. * Bath and Beauty Products: Natural BeautyProducts, Ayurvedic Products, Makeup Kits, Face and Hair CareProducts, Cosmetics, Kajal, Perfumes for Men and Women. * LatestDesigner Bags: Hand Bags, Jhola Bags, Jute Bags, Ladies Clutches,Men’s Wallets, Mobile Covers, Pouches, Potli Bags. * Accessories:Stoles, Belts, Key Chains, Sarees Brooches & Pins, DesignerUmbrellas, Mufflers, Turban Safa. * Health Care and Natural OrganicFood Products: Chocolates, Dry Fruits and Health Supplements Everyday more than 10,000 new products are added to our store. We alsohave: • Over 100,000 Sarees online • Over 200,000 Salwar Kameez andsuits online • Largest collection of Anarkalis online • Largestcollection of Lehengas online • Largest collection of Jewellery,Home Decor, Furnishings, and other ethnic products online We lovehearing from you. For queries, ideas and suggestions, drop us anemail at [email protected] Download the app now to getthe best shopping experience online.